Those who seek the frontiers of their creativity and who strive to reach higher levels of consciousness and wisdom, were described by Maslow as 'self-actualized' individuals. He described a hierarchy of human needs in which our basic survival is the first priority, and the needs concerned with our highest potential follow on when other needs have been met. We all have needs for oxygen, food, water and a relatively constant body temperature. These needs are the strongest because if deprived, we would die. Our safety is the next priority: children often display signs of insecurity and their need to be safe. Adults, too, need the security of a home and means of income, and often have an underlying fear that these may be lost, e.g. in war or times of social unrest, or due to misfortune. We have mastery needs: to be able to get our own way, to establish some control over our situation and environment, to express some degree of personal power, to be able to communicate and obtain objectives. And we have needs for love, affection and belonging. People need to escape feelings of loneliness and alienation and to give (and receive) love and affection, and to have a sense of belonging with high quality communication (with understanding and empathy). People then need to feel good about themselves, to feel that they have earned the respect of others, in order to feel satisfied, self confident and valuable. If these self-esteem needs are not met, a person may feel inferior, weak, helpless and worthless. 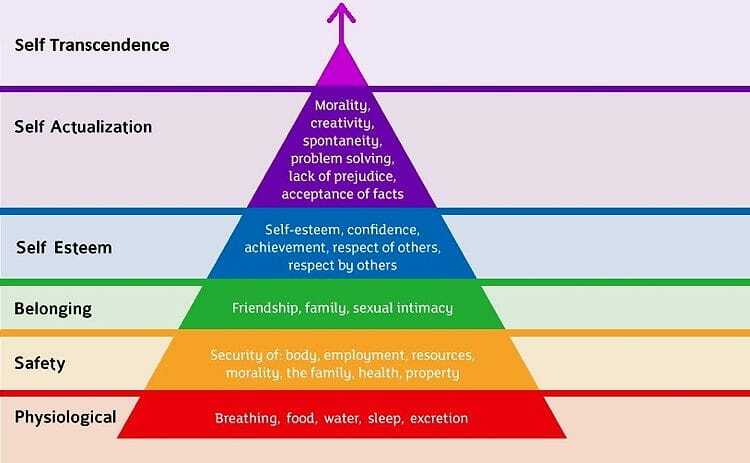 Maslow describes self-actualization as a person's need to be and do that for which the person has a vocation. It is his 'calling', a full expression of his or her creative potential, of their true self. If tnot moving along this path, the person feels restless and frustrated, even if successful in other respects. One reason that a person does not move through the needs to self-actualization is because of the hindrances placed in their way by society. For example, education can act to inhibit a person's potential (though also of course equally it can promote personal growth). So can other aspects of the family and culture act to condition and funnel an individual into a role that is not fulfilling. To escape this conditioning, a person has to awaken to their situation, to realize that their life could be different, that there are changes that can be made in the direction of self-actualization. To promote our personal growth, we can learn to be authentic, to be aware of our inner selves and to hear our inner feelings and needs. We can begin to transcend our own cultural conditioning and become world citizens. We can help our children discover their talents and creative skills, to find the appropriate career and complementary partner. We can demonstrate that life is precious, that there is joy to be experienced in life, and that if one is open to seeing the good - and humorous - in all kinds of situations, this makes life worth living. Beyond self-actualization we have a need for higher, transcendent truth - the need to make contact with the creative force that is beyond the human personality, to make sense of all the suffering and injustices of the survival struggle on earth. This need has been evident in all cultures, expressed by all religions, and is the spiritual path towards enlightenment, towards knowing God and one's self as God, towards discovering the truth of All That Is. It is only by having at least a glimmer of this spirituality that we each are part of, that we can aspire to the highest potential of being human. To be able to genuinely love and to forgive unconditionally, we need to see in all others - even our enemies - the same essential quality that we ourselves are part of. 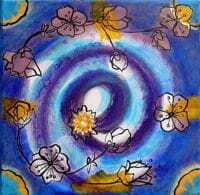 Spirituality is a transpersonal quality, it is beyond the ego and obsession with the self. It is the maturity of intuition. The path of personal transformation is primarily a process of becoming aware of, facing up to and taking responsibility for one's thoughts, feelings and actions, and then expanding this self-realization by communicating with others, retaining integrity whatever the response, and further enhancing the quality of communication with ever-increasing empathy and understanding. Through understanding others better, we can recognize their essential goodwill, however misguided it might have become, and begin to recognize the spirituality of humankind.